A simple discussion on Quantum Mechanics and "Quantum Teleportation". Quantum Mechanics (QM) is a real working horse in the microscopic arena of "field- and particle" physics. But countless physicsts, philosophers (and who knows what else) broke their heads on the "interpretations" of QM. Indeed, the stochastic character of QM, and the "descrete-ness" at times, is sometimes hard to "link" with "reality" (whatever that is). but plenty effects remain, which needs much more study. Let's try to find out what "Quantum Teleportation" seems to be, and, let's try a very simple approach. I suppose that I have to start with a general intro into QM. Otherwise, any talk about Teleportation, would not make much sense. which has a "spin" which is the superposition of two basis states ("up" and "down"), simultaneously. Since only a "state" is transferred, QT has nothing in common with "Teleportation" of material objects. As we will see later, this is not a "cloning" process, since we will see that the state of "qA" will be lost. One prerequisite is the existence of a socalled non-classical "EPR" channel between entangled particles. To actually transfer the information (bits) of the state of a qubit, also a classical channel is required too (like laser, EM radiation etc..). So, since a classical channel is required too, no "laws" from Einstein's relativity theories are challenged or broken. entertaining note, is actually my main motive. But, I really want it to be informative as well. really started to set the QT train in motion. It's widely regarded as the classical article on QT. You can find that article here (researcher.watson.ibm.com). Chapter 1. Just a few milestones, to get to the notion of the "wavefuction"..
1.3 Double slit experiment: interference patterns. Chapter 2. Hilbert space/Vector space. Or, the representation of a "state". 2.1 General representation of a "state vector"
2.4 Example of a 2 statevector: representation of a "qubit". Chapter 3. Quantum Information versus Classical Information. Chapter 4. Collapse of the statevector replaced by Decoherence. Chapter 5. Some remarks on Commuting/Non commuting observables & Heisenberg & measurements. 5.1 Commuting and Non commuting observables. Chapter 6. Product states and Quantum Entanglement. 6.1 Simple "pure states" and simple "seperable states". Chapter 1. Just a few milestones..., to get to the notion of the "wavefuction". It was formulated (around 1924) by 'De Broglie', that there exists a "relation" between momentum (p) and wavelength (λ), in a "universal" way. In fact, it's a rather simple equation (if you see it), but with rather large consequences. It's this: p = h / λ (where h is Planck's constant). Here, λ is the "wavelength" of the "entity" (like a particle). 'radiation-like' property, which stuff like radio waves (and other waves) display. you can associate a "particle like property" like momentum to it, but a "wavelenght" too. So, what's going on here? Do we have a "matterwave" or something? for the opposite, so to speak. Namely, that radiation at certain experiments, seemed to behave like matter. It seemed that radiation displayed to have "momentum" as well. emitted in "quanta" (discrete energy packets). But not only that, it seemed that those quanta possessed "momentum" too, as was observed in certain experiments. radiation behaves like matter, but other circumstances, matter behaves like radiation. It must be said that the effects are observed in the microscopic Domain. Indeed, QM seems to operate (or is effective) on a small scale. undergoes with respect to time, when that system happens to be in some sort of force field. This quantum system is represented by a "wave function" Ψ (r,t), which will be explained in a minute. where the Hamiltonian "H" just stands for all forces and fields operating on the system. It should make sense, doesn't it? A system changes in time due to the forces or fields acting on it. Usually, it is supposed to be applied to microscopic systems, like for example elementary particles etc.. However, in our macroscopic world there are similarities too: if you apply a force to a ball, it starts to roll. So, believe it or not, such solutions are thus indeed wave equations. Actually, the Schrödinger equation applies to a "quantum system", for which a good example would be a particle. Now, this too suggests that a particle is sort of "smeared out" in space. However, such a view was never fully satisfactory. adopted the view that the wave function Ψ, can best be viewed as a probability distribution of the particle in space. around the atomic nucleus (instead of circular orbits). Maybe you like to "google" on that further. One of the many experiments that shows the quantum nature of light (or in general, ElectroMagnetic radiation), is the "Photo electric effect". The experimental setup, is rather simple. But it's fair to say that the results of such experiments were a large stimulus for Quantum Mechanics. In short it is this: of you shine light on a sheet of metal, under certain conditions, electrons get's freed from that metal. If the frequency is too low, it will not happen. No matter how intense that light is, it will not work. Only if you use a very precise frequency, electrons will be emitted. That happens even when the intensity is very low. of energy is poured in, and it should expell electrons of the metal. But none is freed. Now, if the intensity is very low, but of a certain freqency, electrons will be emitted from the metal. It was percieved as really strange (at that time). It was not in accordance with "continuous wave theory" like the one from Maxwell. Einstein's reasoning explained why the energy of freed electrons was dependent only on the frequency of the incident light and not on its intensity. I recommend to download a small 'simulation' program (from colorado.edu), which illustrates the 'photo electric effect' brilliantly. If you go here you can download it, and run it on your workstatstion. while at each colour (freqency) also varying the "intensity" of that light. come in "discrete" steps. This does not mean that QM deals with "discrete" properties or entities only. Oh no! However, it's an example of how QM can differ from "continuous classical theories". Again, here we have a relatively simple experimental setup. However, in some cases, the results are quite puzzling. But, generally speaking, the experiment is a strong "plus" for wave-particle duality, as we will see. Please take a look at figure 1. The picture in the middle, looks like how Thomas Young performed his experiment, in the early nineteenth century. He used an ordinary light source, and a screen with two narrow slits. bands of lighter and darker regions can be observed. At later times, these experiments were repeated, however this time using "true" particles, like electrons or neutrons. Amazingly, a similar "interference pattern" is then observed. Fig 1. The double slit experiment. At this stage, we have to bypass certain angles to approach stuff, like using Heisenberg theorems, or viewpoints from "weak" measurements. However, what we are going to see in a minute, is already spectacular enough. But let's start with an easy explanation. Using light, and the classical wave interpretation, the results ("interference pattern") is as expected. When light passes the two slits, at such a slit, it will be "defracted", and a spherical wavefront travels to the screen. But keep in mind that there are two slits. Now, the waves are "sinusoidal" and have a certain fixed wavelength. Even without calculations whatsoever, you can imaging that those waves travel different lengths, before they reach the screen in the back. of those waves cancels out (the centre of a dark region). At other points on the screen, it holds that the wave from slit 1 happens to have a max amplitude, while the wave from slit 2 is max too. This will then be the case for the centre of the bright bands on the screen. it will be "n x λ" (n as an integer number), and thus they amplify (the center of the bright bands). At other places it will be "½ x n x λ", so the maxs and mins of the waves, cancel out (the center of the dark bands). And ofcourse, there are regions where the waves partly positively or negatively add up (regions between the bright and dark bands). Here, it gets interesting if we lower the intensity. So, suppose we have a situation where occasionally photons are emitted. Next, we observe the screen in the back. Now, we can see the small "impacts" which at first sight, are randomly distributed on the screen. However, as time goes by, we see that an interference pattern builds up, exactly as we saw above. are emitted one after the other, with sufficiently large "gaps" between those emissions. The following may seem unbelievable (at first). Many physicists say that the photons are interacting with themselves, within their own wave packets. to produce the interference pattern. So, you might be tempted to suppose that a quantum goes through one slit. However, the best view is that such a quanta goes through both slits simultaneously. This is difficult to reconsile with a "matter/quantum - like" view of radiation. But there is no good alternative to explain the "interference pattern", if we use photons which are emitted one after the other. So, it really looks like, in some strange way, that each photon is interfering with itself. But hold on. Now let's see what happens if we do not use light, but "true" particles like electrons. after a while, an "interference pattern" is build up. Again, we must say that an electron goes through both slits simultaneously. like for example if we would use Heisenberg's theorems, or see what we have with commuting- and non commuting observables, and using "weak" measurements. We have to leave that for a later moment. However, what we discussed above, is really true, and at this point, quite amazing. The discussion above partly reinforces the idea "particle-wave" dualisme. However, what it really shows is that we must "give up"
the idea of a photon or an electron having location. The "location" of such an entity (like a photon, or electron) is not defined until it is observed. on the results of this "seemingly" simple experiment. that it makes no sense to ask at which slit the electron passed through. Ok, so the electron behaves like a "wave" here. I must say that this is a common interpretation among Physicists. However, not all physicists fully agree on that interpretation. But, If it interfered with itself, it just "looks" like as if multiple 'waves' were 'superimposed'. But there must be some connection with "probabilities" too. The Schrödinger equation from section 1.1, might help us too, understanding the principle of "superposition". It's just a "partial linear differential" equation, and there is nothing "fuzzy" about it at all. and it seems a nice starting point for QM. Since the equation is linear, it means that superpositions (additions) of solutions, are solutions too. Ask any mathematician which is nearest to you: he/she will absolutely confirm that ! is a solution too (it's just math..., don't worry about it). In fact, any sum of solutions..., is a solution. is a solution indeed, but it looks like a "flat" wavefront, which does not "normalize"! over all space, you will end up with an infinite number. That can't be good. That can't describe a particle. as you move "away" from the packet's center. However, theoretically, even at large distances, the amplitude is not "0", but it sort of asymptotically nears "0" the further you go. It's very important to realize, that such a wave packet is actually a sum of superimposed (summed up) waves. Often, it is called "superposition of states", where each state represent a certain "probability" that the particle actually resides in. that is, sinusoidal-like waves in "shape". That the component waves (states) of the packet are coherent, is often interpreted as that they do not "spread". However, a wave packet in general. "naturally" spreads because it contains waves of different momenta and hence different velocities. They all exist at the same time. interference from those superimposed waves. Fig 2. Illustrating a Flat wave versus a wavepacket. Chapter 2. Hilbert space/function space/vector space. Or, the representation of a "state". the original framework of QM, grossly in the period 1900-1938. Originally, to work with QM, a "calculus" type of mathematics was used initially (like the partial differential equation of Schrödinger). Somewhat later (in that same period), a "vector/matrix" type of approach to QM, was introduced. In many ways, that was in large thanks to Dirac. This indeed made operations in QM much more uniform, and way better to understand (I think). However, new work/discoveries as from, say, 1950 up to now (2015), were enormous. Also in the field of Interpretations of QM. and the "no-nonsense" interpretation (as some new physicists apparently seem to view QM lately). Now, here is a little about Hilbert space/function space/vector space analysis. formal definitions on Hilbert spaces, complex spaces, conjugates, bras & kets, all of them with lots of theorems and collaries (and proofs thereof). need the info to get there. in 2 dimensional space (a plane), or 3 dimensional space, is really easy. Take a look at figure 3, where we see a picture of a point in space (1,2,3), and a vector "pointing", from the origin "O", to that point. Fig 3. A vector in R3 (3D space). In figure 3, you see the vector (1,2,3) "going" from the origin "O" to the point (1,2,3) in space. followed by "3 unit steps" in the z direction. With a little imagination, you see the "unit vectors" (1,0,0), (0,1,0) and (0,0,1) positioned along the x, y, and z directions, respectively. (1,2,3) = 1 x (1,0,0) + 2 x (0,1,0) + 3 x (0,0,1). Remember the "superpostion of waves", or "superpostion of states" from section 1.4? Indeed, the quantum system (like a particle) is in een superpostion of such basis states. of the original (1900-1950) formulation of Quantum Mechanics! Instead of fully writing down all unit vectors of the superposition, often the Greek ∑ "summation" symbol is used, to denote exactly that. Those basis vectors are often callen "eigen states". So, a quantum system then, written in vector notation (the State vector), generally is a superposition of those "eigen states". of the idea in the early days of QM, all the way up to today. where |0> and |1> are "basic" vectors, it looks like a simple vector superposition. But, something weird is going on. We only know that |Ψ > is |Ψ >. must add up to "1". The phrase "only when a measurement is done, we will find one of the eigenstates", is amazing. Suppose you find the state |1>, then what happened with |0>? |Ψ >= α|0> + β|1> means that |Ψ > "exists" as |0> and |1> at the same time. However, such an idea introduces it's own difficulties. probabilistic behaviour we see in QM, might lead to idea's of "parallel universes". That is: at an observation of |Ψ >, you might found |0>, but you might also have found the state |1>. So, why not rephrase the matters like this: In one Universe you found |0>, and in another you found |1>. However, such an interpretation is only shared by a lower number of Physicists. In general, "superposition" is generally accepted among Physicists, and the substates exists simultaneously. In math (Dirac notation), you may write it as an expansion of eigenstates, as a mathematical tool. In that sense, it works. However, there still remains the issue of interpretation of such description. You may also view a "pure state" as a single state vector, as opposed to a mixed state. So, even at this stage, we already may suspect what a mixed state is. Thus "pure states": We have seen them before in this note, sofar. They may be represented by a (Ket) vector. carrying some other states simultaneously. Although it can be confusing, the term "superposition" is sort of reserved for pure states. This is a shorthand notation. Then i runs from "1" to "N", or the upper bound might even be infinite. and is identified as a certain unknown observable of a single entity, as a single particle. So, a pure state is like a vector (called "ket"), and this vector be associated with a state of one particle. A pure state is a superposition of eigenstates, like shown in equation 29.
because the system's evolution in time can be calculated, and Operators on pure states work as "Projection" operators. of finding the state to be in the |uai> eigenstate (or basisvector) after a measurement has been performed. of the basis states simultaneously.Then, the "keyword" here is "simultaneously". However, this interpretation depends on your view of QM, since many "interpretations" of QM exist. But "superpostion" will always hold, and is a key term of a pure state (like equation 29). Note that some authors treat it that way. But in general, undetermined coefficients are OK too. As long as we can talk of a "ket", we have a pure state. about interpreting it as a linear combination. In fact, we only know that |φ> = |φ>. That's really it. Only when an observation is done, we find some of the eigenstates. summation (or expansion) of eigenstates. However, we only know that |φ> = |φ>, and no more. The expression "linear combination" therefore, is subject to interpretation in QM. A "mixed state", is a mix of pure states. Or formulated a little better: a probability distribution of pure states, is a mixed state. It's an "entity" that you cannot really describe, using a regular Ket statevector. You must use a density matrix to represent a mixed state. Another good description might be, that it is a "statistical ensemble" of pure states. density ρi, where 0 ≤ ρi ≤ 1 and Σ ρi = 1. It cannot be stressed enough, that a linear superposition is not a mixture. Mixed states are more commonly used in experiments. For example, when particles are emitted from some source, they might differ in state. In such a case, for one such particle, you can write down the state vector (the Ket). But for a statistical mix of two or more particles, you cannot. The particles are not really connected, and they might individually differ in their (pure) states. So, you can only write down the "density matrix" of such an ensemble. In a certain sense, a "mixed state" looks like a classical statistical description, of two pure states. wave function, or Ket description. like |φ > < ϕ|, which indicate that we are dealing with a "density matrix". Hopefully, you can "see" something that "looks" like a statistical mixture here. Note that this not an equation like that of a pure state. in the form |φ > <φ|. Especially "intermediate" results can be quite confusing. exist too, adding to the difficulties in reckognizing states. A certain class of states are the socalled pseudo-pure families of states. This refers to states formed by mixing any pure state, with the totally mixed state. which is certainly not the case here. From the former section, we know how to represent a State vector as a superpostion of "eigen states" (unit vectors). But, at a measurement, "something" happens. only that it is in a superposition of (possibly) many states at the same time. Remember the electron we used with the double slit experiment of section 1.3? It seemed that it passed both slits. We even had to give up our notion of "clear path" or "clear trajectory" here. Now, the following might not strike you hard, initially, but it's really something! There won't be ever a interference pattern at the screen in the back. suddenly collapsed into a specific location, one of the possible eigenstates of that observable. There are many other examples. The next one is a bit "blown up", but I want to make a point clear, even with an exeggerated example. Suppose we send out a photon. We should regard it (for now) as a sperical wave, since we do not know anything of it's location. all posible locations "collapsed" into that single point. The system is in a superposition (or linear combination) of the eigen vectors |a> and |b>. The coefficents "a" and "b" should determine the actual state of the system. However.., are we really allowed to talk that way? QM tells us that we only know that |Ψ > is in a superposition of the eigen vectors |a> and |b>. And we have not observed, or measured, anything yet! state |a> or in state |b>. This might be percieved as quite weird. Actually, some folks formulated it this way: our measurement "destroyed" the former quantum system. It (the quantum system) is something else now. This is very close to the famous "measurement problem" in QM. It seems that our measurement was quite "disturbing" to the system. Note: many people also call it a "strong measurement", or "perturbative measurement". The stuff clearly shows us that QM is probabilistic in nature. Moreover, experiments have shown that those coefficients (a and b) relate to the probability of finding the system in state |a> or in state |b>. Then, since the probability of finding the state (after measurement) to be in |a> or |b>, must be "1" (or 100%). Ofcourse, we can only find |a> or |b>, so the total chance added up, must be 100%. However, the chance to find |a>, or to find it in |b>, is less than 1. It could be (for example) 30% and 70% respectively. This can only be effectively determined after many experiments and simply count how often you have found |a> or |b>. The interpretation of this phenomenon has long been a true issue for physicists and other scientists like philosophers. It is still not fully understood, however, the socalled "Decoherence theory" provided us with a somewhat simpler way to digest it. I like to touch on "Decoherence", a bit later on. What we have seen here, is often called "The Copenhagen Interpretation", and it's great if you would google somewhat further on this. a measurement again, then you will find that same eigen vector again. At least, that would be obvious from the theory presented thusfar. 2.4 Example of a 2 statevector: representation of a "qubit"
since "qubits" are used in the new technique of "Quantum Computing". where |a> and |b> are ofcourse the eigen states (base unit vectors), and a1 and a2 are just numbers (the coefficients). Now, since qubits are used in quantum computing, the |a> and |b> vectors are often "rewritten" as |0> and |1>. One is to emphasis the "computing" element, since in traditional computing, ordinary "bits" (0,1) are the most fundamental units, ofcourse. There is ofcourse an enormous difference between classical bits (used in regular computing) and "qbits". - A regular bit can only be "0" or "1". - A quantum bit, or qubit, is a superpostion of |0> and |1>, and those "span", in principle, an infinite number of resultant states. can be visualized as a circle. Please take a look at figure 4. Fig 4. 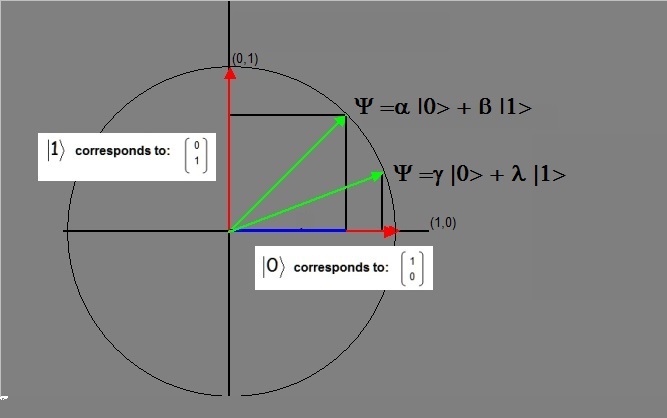 Ψ as all possible combinations of |0> and |1>: the Bloch sphere. can "span" a Ψ statevector. That is, a1 |a> + a2 |b> will define a "circle" of possible eindpoints of the statevector. Just keep in mind that a1 and a2 are numbers where the real part is < 1, that is, it needs to hold that |a1|2 + |a2|2 = 1. Since we have two independent eigen vectors (|0> and |1>), it automatically defines this vectorspace as 2 dimensional (or a plane). So, many folks visualize state |0> as the unit vector (1,0) (along the x-axis), and |1> as the unit vector (0,1) (along the y-axis). since the State vector will "collapse" or "decoheres" into one of those states. eigen states, could be a "candidate" for a qubit. Again, unmeasured, the system would be in a superposition of those states. Often, a spin 1/2 particle, is a good choice, like a "trapped" electron (quantum dot). The big "enemy" of researchers is decoherence with the "environment", since that will alter the state of the qubit. are simplified to a high level. For example, some "States" cannot be represented by by a "ket" or Statevector. Chapter 3. "Quantum Information" versus "Classical Information". We are now ready to compare some aspects of Quantum Information, to "Classical" information. To narrow this down a bit, let's compare information of qubits to "classical bits". Maybe not all of the items below will be immediately clear, but don't worry about it. then some obvious observations can be made. and this can be read, copied to tape, or disk, or another computer, or multiple disks etc..
you can read a register, or memory location, without altering it. It's "state" will not be altered. you can "clone" classical bits without any problem. you can "broadcast" classical bits to many destinations without any problem. If "power keeps on" and futher you do nothing at all, a memory location keeps that same bit string for years. if you don't know the state (content) of a register (or memory location) you can still copy it. You don't know the "value" of a qubit. It's "unknown". You only know it can be represented by a superposition of states. If try to "read" it, you interact with it, which "alters" it state. You cannot "copy" a qubit, since you cannot read or measure it precisely. It's a superposition, unless you "collaps" or "project" it. In general, if you "measure" a superposition of states, you get different outcomes all the time. At best you can get (over time) an expectation value. In general, if you "measure" a Quantum System, you get "a value "which you might consider as "classical" but it does not represent the former (fuzzy) Quantum state. That is lost. Quantum Information cannot be fully converted precisely to classical information, and the other way around. How about that? Would you (largely) agree with the listings above? Before we go to "Teleportation", we need need some basic information about a fantastic quantum phenomenon: Entanglement. Then, we need just a tiny bit more knowledge of vector calculus or "ket" algbra. Then, in chapter 7, we will finally deal with the true subject of this note: Quantum Teleportation. Chapter 4. "Collapse of the state vector" replaced by "Decoherence". Next, we spend a few words on a couple of terms that were mentioned before: "Collapse of the State vecor (or wavefunction)" and "Decoherence". out of many possible results, just one is "selected" in "some magical way". after interaction with an observer (that is: if it's being measured). and while you could not say that it had true "advocates", it's a fact that many just accepted it as a "workable solution" for the Theory and observations. (You may note that I completely bypass any thoughts about Hidden Variables, as an alternative for the collapse). In in the late 70s, 80s and early 90s of the former century, research got a renewed momentum to find a good "internal explanation" for the presumed "collapse". This is no to say that much earlier, some folks (like Von Neumann in 1932) already investigated idea's that are quite close to "decoherence". for just an "apparant" Collapse. There is no "sudden collapse", or "sudden reduction", it only appears to be so. measure anything at all. But it is especially true, if you let the quantum system interact with a "measuring device". In QM, each state that contributes to the superposition of the State vector, needs to be in a coherent state. Remember from section 1.4, that the waves (states) of the "wave packet" are coherent, which means they are similar like harmonics. You can see them as solutions to a "harmonic occilator", that is, sinusoidal waves in "shape". to the environment, until a pure state is left over. This process is thus responsible for an apparent collapse. and the former idea of the sudden "reduction", or "collapse", of the statevector, is replaced by decoherence. Especially Zurek created nice articles that go into depth in the theory of Decoherence, while it's still nice reading. I can recommend this article (arxiv.org), although it's quice "spicy" (technical). Sometimes you may think that QM is kind of "fuzzy". Actually, it's generally speaking not "fuzzy" . If you look at a wave packet (of section 1.4), a lot of waves are superposed, with a sort of gaussian probability distribution. It might look "fuzzy", but it's just a superposition, and we can even capture it in an equation. So is it really fuzzy? Probably not, but what might look "fuzzy" is the "probability distribution". Such statements are not really exact. Besides that, different folks may have different interpretations too. Please consider again the formalism of section 2.2, where we represented the Statevector (of a quantum system) as a superposition of eigenstates. In such a case, if you observe the quantum system (or perform a measurement), then we find a eigen state with a certain probability. is that this is associated with a "probability". Indeed QM, is intrinsically "stochastic". still are part of the theory. But, again, different folks may have different interpretations. And, what we have not seen here much, is that at many places in QM, discrete "quantum numbers" play an important role. Question is: if we measure for example the "spin" of a particle, then the statevector for that observable will collapse/decoheres to an eigen state. So, did we now collapsed the "whole of the particle", or just that particular property? In general, this is not so easy to answer. then it's still an electron! However, that specific observable decohered (collapsed). absorbed the energy quantum, and was freed, or went into a higher atomic orbital..). How many observables may a quantum system have? Indeed. It can be quite a lot. Only in the very most simplest case, an observable defines the state of of a Quantum system. position in space (wave packet), a momentum, and possibly it may have a "spin" too. Up to now, we have "acted" as if one observable defines a quantum system. Now, we know that in general that is not true. get a similar naming as the observables (with an additional token like a circumflex, hyphen etc.., but that depends a bit really). In the equation above, you see that in this case the order of taking measurements does not matter! We are not going to mathematically prove it, but the following may sound plausible. It can be true if both observables (State vectors) can be expanded (or written) in a common set of eigen vectors. Often, people say that A and E have a "mutual eigenbasis". and thus both (sort of) more "pinned down" the state of the quantum system. It's also often said that the observables are "compatible", which is the same as "commute". can be measured and definite values can be found at the same time. 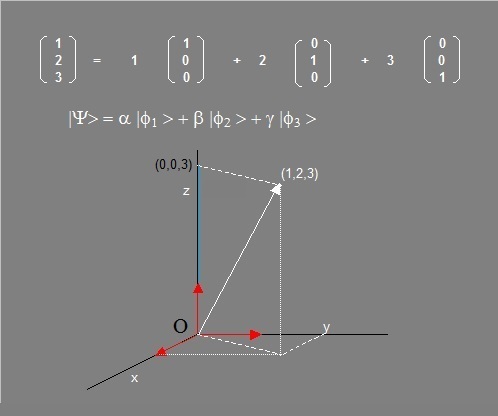 - This is only so if Ψ is an eigenvector of both operators. - Two observables can be known simultaneously only if they have a common set of eigen vectors. There are also Non commuting observables (or Operators). It's also often said that those onservables are "incompatible". Two incompatible observables cannot have a common set of eigenstates (no "mutual eigenbasis"). for E at the same time (simultaneously). Gaining knowledge of one observable through a measurement, destroys information about the other. then you can hopefully see that measuring A and E would always produce an eigen vector in the same vector space. Since finding an eigenvector was already a matter of probability, but the system stayed in the same vectorspace. So, the second measurement will produce again an eigenvector with a certain probability. But, it boils down to the fact that you can find precise values for A and E, even at the same time. so much, that the uncertainty in E increases highly. A perturbative measurement on E disrupts everything so much, that the uncertainty in A increases highly. You cannot have precise values for both observables. I realize that this is not a good attempt to try to explain the differences between commuting and non-commuting operators. Using math, it could be explained way better. But I try to avoid math as much as possible. and then 90% along the z-direction, will produce a different orientation of the object than the other way around. Position and momentum does not commute. If you measure precisely the position of a photon, the momentum is destroyed. Some historians have researched where the "principle" actually first originated. in papers of Wiener to believe that actually "Wiener was first...."
Sometimes the Heisenberg uncertainty principle is associated with the "precision of measurement". That is not a good view, really. which constitutes one of the hearts of QM. correct to say that your measurement did not "disturbed" the swimming pool at all. It was not a "perturbative" measurement. The large swimming pool was not changed by your measurement. and any measurement you perform, will be "perturbative" to some extend. that your measurement is "perturbative". It's a core problem, and even up to this day, different perspectives are published in a whole range of scientific articles. A "perturbative" measurement is also often referred to as a "strong" measurement. could give information about the "undisturbed" quantum system. This idea raised quite some debate in the scientific community, which is not over yet. you "get it for free". In fact, it's really not directly related to the "measurement problem". position (x) and momentum (p). In fact, as from the moment that you proposed a "wave packet" to express the "position" of a particle, the "Heisenberg uncertainty principle"
will be build in automatically. It arises from the wave properties which are inherent in the QM description of nature. Really ! It has been proven, theoretically and experimentally, for many quantum systems. For example, if you go to the following wikipedia article, and go to the "particle in a box" problem, the inequality will be derived in a fairly simple way. Please note that the derivation has nothing (!) to do with "precision" of measurements. It's just build deep in the description of QM. Next, a discussion on "Quantum Entanglement" is on the list of "things to do". 6. Product states and Quantum Entanglement. We already have seen some "State vector" examples. I will provide for a few more simple examples here, in a minute. Technically, QM distinguishes between "pure states" and "mixed states" (and even others), which can be quite confusing, really. a "State vector" as linear combination of eigenvectors, which are in superposition simulaneously. I want to keep that image, so to speak, as not to introduce too much complexity. and it has certain complexities in interpreting coefficients as probabilities. Mixed states introduce an additional layer of complexity, and is often used in "ensembles" studies. However, most Physicists say that "mixed states" can only be described using density matrices. Here we keep it simple (and thus less general...). 6.1 Simple pure states and simple seperable states. an outer product is used to accomplish that. The equation above, is a way to describe the combined state of both qubits. It's just a product state of all components, and those components are not further "correlated". Note that for example |00> is no more than a short way to mean |0>|0>. since their joint state is a simple product of both states. "ac + ad + bc + db" is seperable into "(a + b) x (c + d)". "Entanglement" in Quantum Mechanics (QM) plays a crucial role here, so let's spend a few words on that subject now. have seen above. However, this time, the systems are "not seperable". It means that we cannot "seperate" the systems "just like that"!. Their "intertwinement"is so high, that we speak of "correlated" systems, with respect to the "observable" (often spin, polarization). Automatically, since we cannot seperate the individual states anymore, a measurement on one particle, affects the other as well. it has important consequences, and produces lot's of brain fire-crackers for "philosophers" and others who want to understand nature. from it's partner particle. It's commonly accepted that still holds that: a measurement on one particle, affects the other as well. then we might be very puzzled. than some "magical" signal would need timewise. So, the partners cannot "inform" each other about a change in state. by A. Einstein, B. Podolsky, and N. Rosen which resulted in what later was called "The EPR paradox". most of their arguments actually refer to the effects of entanglement, collapse of the state vector, and other aspects of QM. It's certainly worth it, to perform a web search, and browse through some articles which explain the original article. - We do not correctly describe the entangled state, and/or interpret it wrong. - SpaceTime issues related to "Entanglement" are not (yet) understood. - Nature sometimes just works "non-local" in certain events. This is the non-locality principle. There are some interesting studies to the "nature" of "what" exactly sort of "binds" the partners of an entangled system. The "non-locality" principle is widely accepted. However, at this moment it does not deliver the "mechanics" of the strange binding. In chapter 7, we will see that it is often called "The EPR channel" as a tribute to the famous EPR article. Some further studies try to explain the EPR channels using further maths on Hilbert spaces, and the resulting "channel maps" thereof. One consequence seems to be, that "time reversals" are neccessary to keep the theory consistent. Needless to say, that if true, it would be very spectacular. As an example, you might browse through this article (arxiv.org), but it's quite hard to read. Other studies try a lattice approach. Still others, use any other concievable way to to pursue the EPR channel further. at the ultimate smallest scale of SpaceTime. The EPR wormholes then, supposedly connect entangled particles. since the original ideas were published. As an example, you might browse through this article (arxiv.org), but here too, it's not easy to read. One thing is for sure though: physicists do not accept any "faster than light" signalling, to explain it. Here is a well-known example, namely a singlet state of two particles (particle 1 and particle 2) with respect to their spin. So, the wave function above, describes the "common" state of such an entangled system with respect to their spin. Do you see that it is a superposition of the states "|↑1 ↓2>" and "|↓1 ↑2>"? If a measurement is done, and you find particle 1 to be "up" (↑1), then it follows that particle 2 must be ↓2. that particle 1 is "up" and particle 2 is "down". will end the (two-system) entanglement. So, it's not easy to seperate the members of a singlet state, for example, hunderds of meters, or a few km's (or further) apart. they can preserve their qubits and gates for a longer period of time. Here, the system exists in the states |00>, |11>, |01> and |01>, at the same time (simultaneously). We know that it is a "product state" of two single qubits, and it's "seperable". Two qubits (or more qubits) can be in an "entangled" state. There are different possibilities here. Especially, the socalled "Bell states" denote strongly entangled systems. superposition, to denote "where it is" (at Alice or at Bob). Be warned though, many folks just leave it out just as easily. if the system would collapse into that state, it means Alice found |0> (down), and Bob must have found that too. Such "pure" maximally entangled states, could be used as a noiseless "EPR channel" (see below) in Quantum Teleportation. However, the "sender" and "receiver" might only be able to share a "mixed" entangled state (noisy channel), due to the decoherence. Keep this one in mind. Finally, we are "ready" to get into Quantum Teleportation (QT). This will be a relatively short chapter. This is so, since we already have covered so much ground above. For example, we don't need to explain "qubits", "the state vector", "entanglement" etc..., anymore. Quantum Teleportation is not about the "teleportation" of matter, like for example a particle. It's about teleporting the information which we can associate with that particle, like the state of it's spin. For example, the state of the system described by equation 1 above. A collarly of "Quantum Information Theory" says, that "unknown" Quantum Information cannot be cloned. the original information is lost. This is also often referred to as the "no-cloning theorem". unknown information to another location (e.g. copying the content of a computer register, to another computer). In QM, it's actually not so bizar, because if you look at equation 1 again, you see an example of an unknow state. It's also often called a "qubit" as the QM representative of a classical "bit". Unmeasured, it is a superposition of the basis states |0> and |1>, using coefficients "a" and "b". one of it's basis states. So, it would fail. Hence, the "no-cloning theorem" of unknown information. into one of the basis states. and then it gets proven that it can't be done. One of the latest "records" in achieved distances, over which Quantum Teleportation succeeded, is about 150 km. What is it, and how does an experimental might look like? Again, we have Alice and Bob. Alice is in Lab1, and Bob is in Lab2, which is about 100km away from Alice. Suppose Alice is able to create an "entangled 2 particle system", with respect to the spin. So, the state might be written as |Ψ> = 1/√2 ( |01> + |10> ), just like equation 3 above. just as if "they are melted into one entity". In the experiment below, we can use any of those, to describe an entangled pair in our experiment. Now, let's return to the experimental setup of Alice and Bob. Let's call the particle which Alice claims, "particle 2", and which Bob claims "particle 3". Why not 1 and 2? Well, in a minute, a third particle will be introduced. I like to call that "particle 1". This new particle (particle 1), is the particle which "state" will be teleported to Bob's location. At this moment, only the entangled particles 2 and 3, are both at Alice's location. After a short while, particle 3 arrived at Bob's Lab. Next, a new particle (particle 1), a qubit, is introduced at Alice's location. In the picture below, you see the actions above, be represented by the subfigures 1, 2, and 3. (or labeled) as an "EPR channel" between the particles. channel in the classical world. be the source for the "EPR channel/non-locality" phenomenon. Also note the subscripts, which may help in distinguishing the particles. Such a product state, does not imply a "strong" measurement or interaction, so the entanglement still holds. Remember, we "are" still in the situation as depicted in subfigure 4 of the figure above. and some some re-arrangements are done, we get an interresting endresult. the state of particle 3 "looks like" a superpostion of four qubit states.Indeed. Actually, it is a superposition. to alter the state of "Φ12". This will result in the fact that "Φ12" will collapse (or "flip") into another state. of the four qubit states as we have seen in equations 5 and 6 above. Ofcourse, the Entanglement is gone, and so is the EPR channel. that resulted from that measurement on Particles 1 & 2. We only smartly rearranged equation 4 into equation 5 or 6, that's all. by which we can "read out" the classical bits that resulted from the measurement of Alice. This is depicted in subfigures 5 and 6 in the figure above. particle 1 was directly before Alice's measurement. It's an amazing experiment. But it has become a reality in various real experiments. -Note that such an experiment cannot work without an EPR channel, or, one or more entangled particles. on a measurement far away (in our case: the measurement of Alice on particles 1 & 2). 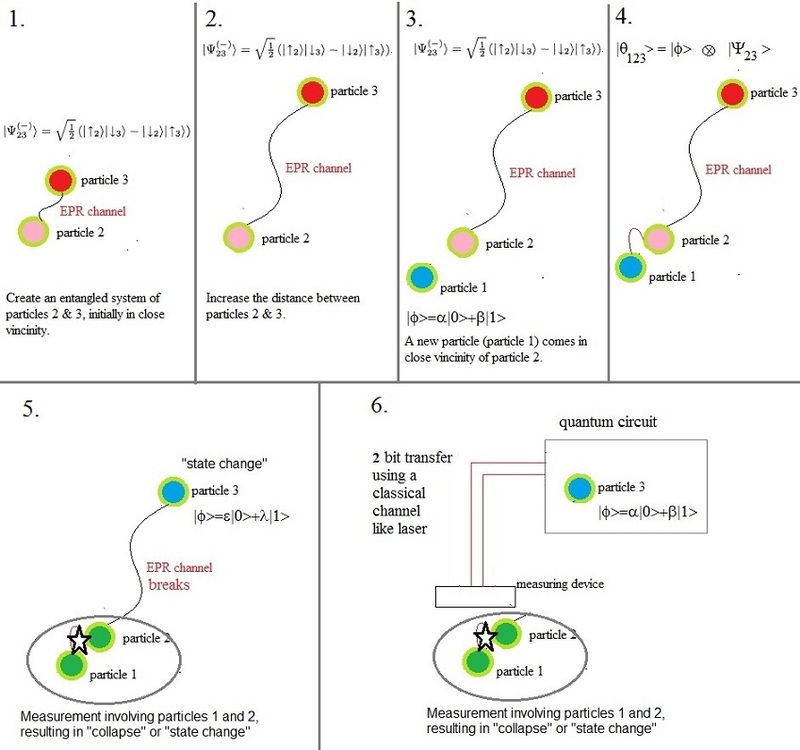 is able to reconstruct the state of Particle 3 into the former state of Partcle 1. This can only work using a classical signal, thus QT does NOT breach Einstein's laws. was "destroyed" in Alice's measurement. Well, that's about it. Hope you liked it!